Offering teeth whitening in Contra Costa and Pleasant Hill, Dr. Kevin T. Dowd and our dedicated team help patients smile with confidence and pride. Our friendly team takes a conservative and consultative approach to cosmetic procedures, allowing patients to feel comfortable throughout the process and well informed of the steps involved. 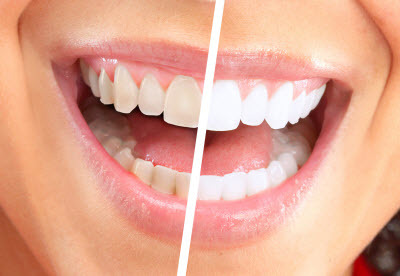 Teeth whitening is a non-invasive cosmetic dental procedure that allows patients to brighten the appearance of their smile and restore luminescence lost over the years. Now one of the most popular cosmetic treatment s patients seek, our practice provides a convenient take-home whitening option so our patients can brighten their smile when it suits them best. For patients with dental restorations or planned cosmetic procedures, it’s important to know that teeth whitening can only affect natural tooth enamel. As such, restorations or cosmetic devices may require further treatment to match natural teeth after whitening. Take-home teeth whitening is a cost-effective cosmetic option that only requires two brief trips to our practice. During the first visit, we will take impressions of your teeth, which will be used to fabricate custom whitening trays. These clear plastic trays will hold whitening products during your at-home treatment. During your follow-up appointment, we will deliver your trays and ensure proper fit. We will also provide you a whitening solution. The solution and trays can be used for 30 minutes, twice daily, until desired results are achieved. We also offer refills of the lightener material so patients can touch-up their smile periodically to maintain an aesthetically appealing smile. Patients may experience sensitivity following whitening sessions, but this should subside shortly after whitening is complete. Additionally, Dr. Dowd carries prescription strength Crest Whitening Strips that also help patients lift stains and achieve whiter teeth. This option is best for those with minor staining looking for an inexpensive cosmetic boost. Dr. Dowd and our team strive to help patients achieve healthy, beautiful smiles. Teeth whitening in Pleasant Hill is just one of the ways we help our patients find more confidence. Stop by our office today to learn more about this and other cosmetic dental treatment options. We look forward to making you smile!